The Sage 990-4 TCX is Lean, Mean, and Green! Introduction: The TCX fly rod is one of the ultra premium offerings from Sage, boasting the finest materials and the fastest action blank they make. As a replacement for the now discontinued but legendary TCR series, the TCX promises more refinement and higher performance for experienced casters through the use of their �G5 technology� rod design. Testing this rod exclusively in saltwater, I was anxious to see if the rod stood up to all the hype! Impressions: Before ordering my 9 weight TCX last January, I had already �wiggle tested� a few and was familiar with the striking good looks. 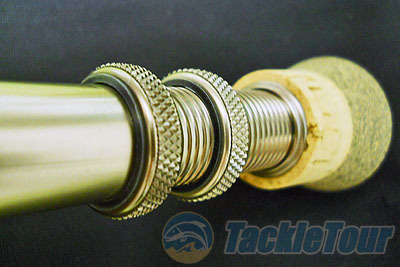 This is undoubtedly one of the most attractive fly rods on the market! The electric green color looks like nothing else, and really �pops� in direct sunlight. Out of all the fly rods I have owned or played with over the years, it is my personal favorite blank color so far. Light olive/tan wraps compliment the blank nicely, and red tipping around the logo and ferrules is a nice touch. 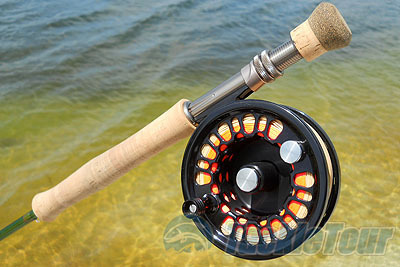 The aluminum reel seat is an appealing dark nickel color, and the reel seat up locking rings really hold the reel securely and never loosen while fishing. The TCX features a full wells flor grade cork handle that is comfortable and is also one of the highest quality I've ever seen. It is pit free and looks extremely clean. Just ahead of the grip is a small hook keeper. Many anglers don't like them on fly rods, but I find it extremely handy at times. Another striking attribute is the weight of the rod...it feels VERY light in hand, weighing just a scant 4 1/8 ounces which is definitely light for a 9 foot 9 weight rod. All of this is packaged in a very attractive green aluminum rod tube with a black cloth sock. Real World Test: I bought this rod solely as a saltwater weapon, so that is where it's usage has been so far. It has traveled to the Louisiana Marsh to target Redfish, the beaches of Florida's east coast to target large Snook, and has also seen use in the local southwest Florida backwaters. The 2 reels that were secured to the TCX for testing were the Abel Super 9, as well as the Galvan Torque T-10 in a matching green color. Fly lines have included the 9 weight Scientific Anglers Mastery Redfish taper, 9 weight Airflo Ridge Bonefish line, 10 weight Scientific Anglers Intermediate sinking Tarpon taper, and some �lawn casting� with 350 and 400 grain Scientific Anglers streamer express lines. The reason for me trying so many fly lines was not merely due to the fishing conditions, but more on that later! 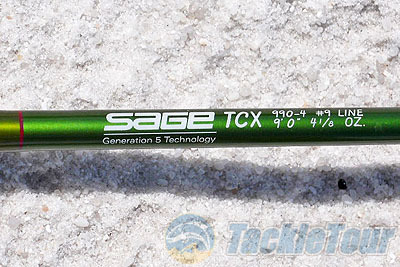 Casting: The TCX makes use of Sage's �G5 Technology�, which basically allows them to make a rod using less material, which translates to a slimmer blank and less overall weight. The thin blank and lighter weight makes for a nice light feel in hand throughout the casting stroke. How does the TCX cast? Well, let's just cut to the chase here; this is an extremely fast rod! The only rod I have ever cast that felt similar to it was the Powell Edge, which many people may not be familiar with since it had just a short run several years ago. The TCX is far too stiff to be a truly versatile rod with all lines at all distances. This should not be a surprise to anyone buying this rod since it is really made for casting power and extreme distance, however I didn't think it would be quite as fast as it is! Casting both the Airflo Ridge Bonefish and Mastery Redfish 9 weight floating lines, the rod loads poorly and feels pretty numb inside of 30 feet. This really became apparent the first time I fished it for Redfish on the Louisiana marsh. Extremely cold weather had slowed the fishing to a crawl, and many of the fish were simply lying motionless on the bottom. They were totally uninterested in feeding unless the fly was cast within a foot of their faces, and many of those shots were well within 30 feet. Casting accurately in such close quarters felt very unnatural with the TCX even with a bulky weighted fly, and accuracy suffered accordingly. 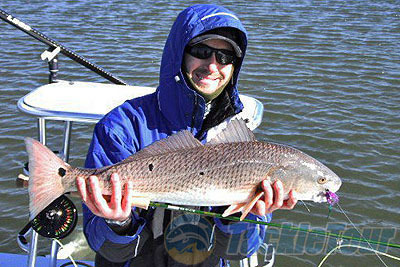 With the ultra fast action of the rod, it demands either more line in the air, or to simply use a heavier line, period! Do either of these 2 things and the rod really begins to wake up. When you start pushing the casts up into the 50+ foot range, the blank just begins to come alive and the power really becomes useable. Very tight loops can be achieved, and both feel and accuracy also improves. While I have used the TCX several times with its rated line weight, I really prefer using it with a heavier line. With a 10 weight intermediate, and a 350 or 400 grain sinking line, this rod feels far better at all distances. The 400 grain actually felt the best to me, and I am positive it would do okay with even a bit more than that. Even though it is a 9 weight rod, it's really best to treat it like a 10 weight when choosing a line. Regardless of what line you do choose, the TCX loves to throw big heavy flies far. If you are looking for a rod to cast a Pole Dancer, big Pike fly, 4/0 weighted Clouser, or similar pattern, this rod should be on your radar! One last note about casting is that your timing and stroke must be dead on to achieve any kind of decent performance with this rod. This becomes even more important if using a large fly and high density sinking line, which could be downright dangerous in novice hands! The TCX is best avoided if you are not a proficient caster. 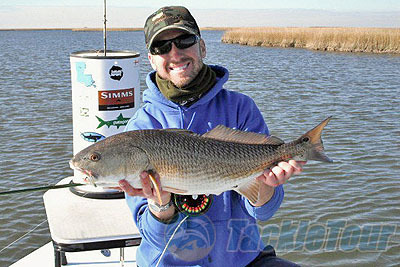 Power: Casting power has been discussed, but what about the power to move fish? The 990-4 TCX provides ample power to fight a good fish, but nothing extraordinary. I feel that the Sage Xi3 series has a little more beef in it to move a big fish. Rightfully so, as the Xi3 is the rod series made specifically for saltwater fishing and fighting large fish. While I have yet to tangle with any true lunkers with this rod, it has ample backbone as any 9 weight should. I have felt many 9 weight rods lacking in fish fighting power, but the TCX feels just right to me in that department. Next Section: Any issues to be concerned about?